Happy New Year! As 2014 gets underway, this blog reaches 1989 on the ARIA top 50 - and it would be a year during which the chart would undergo a pretty major transformation. More on that in a few weeks. Our first chart for 1989 is actually also the final chart for 1988, since it's dated for the period from December 26, 1988 to January 8, 1989 and covers sales for the week prior to that (i.e. Dec 19 to 25). 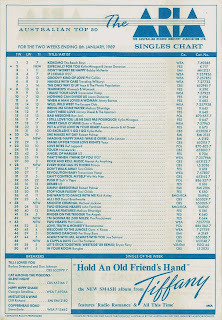 The sales from the two weeks this chart was in record stores were then represented in the following week's chart. Confused yet? How about this... These days, sales figures are calculated from Friday to Thursday, with a new chart revealed two days later at 7pm on a Saturday night. Just to complicate matters, that chart bears the date of the following Monday. So, the current chart, which is dated January 6, 2014, was published on Jan 4 and covers the sales period from Dec 27 to Jan 2. A new year brought a new number 1 - thank goodness! - with Bobby McFerrin finally deposed. However, his replacement wasn't much better. "Kokomo" by The Beach Boys stepped up to the top spot for an interminable seven-week run (although we got rid of two of those weeks in one go with this chart). It wouldn't be the only number 1 that I hated in 1989... and we'll meet one of the others as a new entry this week. The future Wiggles' run of top 50 hits came to an end with this third single from Fingertips becoming the band's first to miss the mark since 1985. Underworld weren't getting any closer to landing another hit with this latest single, which I have no memory of ever hearing at the time, doing worse than previous chart entry "Glory! Glory!". In a double blow for the former chart-topper, this particularly frenetic a cappella version of the song turned into a hit in 1966 by The Young Rascals - a single even more annoying, if it's possible, than "Don't Worry Be Happy" - missed the top 50 completely, rendering him a one-hit wonder. Poor Tiffany. Everything was going so well - she'd hit number 1 in the US and UK with "I Think We're Alone Now", and landed two entries in the Australian year-end top 50 for 1988 (that remake and "Could've Been"). It was a very different story when it came time for album number two, Hold An Old Friend's Hand, which was promoted in the Single Of The Week spot on this week's chart and had a title that sounded like a public service slogan encouraging youngsters to visit the elderly in retirement homes. Since it is the single of the week, attention should really be given to "Radio Romance", which was newly released but would fall some way short of the top 50. The second single from Hold An Old..., "Radio Romance" was a perky enough kind of tune, but one that really just served to show how much of Tiffany's success had been due to clever cover versions. Her original tunes really didn't cut it. I'm not sure if Australia followed the UK and released "Radio Romance" ahead of ballad "All This Time", which had been the album's lead single in the US - but either way, that song didn't even make the top 100 here. How we loved to laugh at the Greeks in the '80s. It was one thing, though, for the likes of Nick Giannopoulos to make fun of his own culture in the original stage show Wogs Out Of Work and 1989's TV series, Acropolis Now, but quite another for blond-haired Anglo Saxon comedian Mark Mitchell to get in on the joke - which wasn't that different from the racist gags trotted out at the start of the decade in sitcom Kingswood Country. Mark's character, Con the Fruiterer, was, after Kylie Mole, the most popular character in sketch comedy series The Comedy Company - and so it only made sense (commercial, not musical) for the greengrocer to follow the bratty schoolgirl into the charts. Whereas "So Excellent" was at least an attempt at a pop song, "A Cuppla Days" was just horrendous - and thankfully its time in the top 50 was brief. Finally, a song I actually like. Single number two from the Buster soundtrack was a change of pace after "A Groovy Kind Of Love" - and that's something Phil (and Genesis) did well throughout the '80s: releasing as many classic big ballads as awesome upbeat tunes. While "A Groovy..." had been a cover of a song from the '60s, which tied in with the setting of the movie, "Two Hearts" was written by Phil with one of that decade's top songwriters: Lamont Dozier, who, together with brothers Brian and Eddie Holland, was responsible for a cavalcade of Motown hits like "Stop! In The Name Of Love", "Reach Out I'll Be There" and "How Sweet It Is (To Be Loved By You)", to name a few. Here it is: my "Don't Worry Be Happy" for 1989. Out of nowhere, Scottish twins Charlie and Craig Reid stormed the Australian chart with this single from their second album, Sunshine On Leith - but I, for one, was not a fan of the jaunty, heavily accented ditty. I mention the accents since I distinctly recall people bunging on their best Scottish brogue and singing along to this... all year. Although the previous three singles from Bad ("Man In The Mirror", "Dirty Diana" and "Another Part Of Me") hadn't performed that well in Australia, the seventh (!) single from the album was a turnaround in chart fortunes, due in no small part to the amazing video which accompanied the single's release. There's a link to the full nine-minute clip in the song title above, while the edited version is below. "Smooth Criminal" was also an important component of Michael's big screen project, Moonwalker, which would have been out in Australian cinemas at the time, I expect. Michael wasn't finished with Bad yet, however - two more singles were still to be taken from the album. If you were to make a list of the characteristics common to all successful '80s hair metal bands, you'd include things like big hair (obviously), leather trousers, groupies and the obligatory power ballad. After rock anthems "Nothin' But A Good Time" and "Fallen Angel", it was time for Bret Michaels and co to take it down a notch with their "Wanted Dead Or Alive". In the US, "Every Rose..." became the band's biggest hit, topping the chart for three weeks. Here we have a timely re-release of some of the late Beatle's best known songs - timely for two reasons. Firstly, it was the festive period, and therefore the perfect occasion for 1972's "Happy Xmas (War Is Over)", which had originally reached number 9 in Australia, to re-enter the chart. Secondly, the documentary film Imagine: John Lennon was in cinemas with the soundtrack of the same name naturally featuring the former chart-topper, "Imagine". Although it's not listed on the ARIA chart, "Jealous Guy" was also included on the triple A-side single. The song, taken from 1971's Imagine album, was best known thanks to a cover version by Roxy Music, who recorded the song as a tribute to John after his untimely murder in December 1980. That remake was a number 1 hit in Australia in 1981, which was the last time both "Imagine" and "Happy Xmas (War Is Over)" had been on the charts here. One of the two contenders for the UK Christmas number 1 that I was referring to last time, "Especially For You" made its appearance on the Australian chart after December 25 had been and gone. Although it didn't take out the festive crown in the UK, the song did eventually reach the top spot there, but in Australia, the duet by the former Neighbours co-stars (Kylie had left the soap, Jason would depart in early 1989) was cruelly denied reaching the summit here, stuck behind "Kokomo" for five weeks. "The idea of a duet seemed a sickly proposition. Still we kept on getting kids coming up to us in the streets asking about this mythical record and grudgingly decided we had to do it... When I heard the finished version I hated it." Pete goes on to say that the song was improved after being remixed a couple of times before release, but it's hardly a glowing endorsement, now is it? Next week: those sales from December 26, 1988 to January 8, 1989 take effect - and interestingly, people were buying the song that prevented Kylie and Jason taking out the UK Christmas number 1. Plus, another song with a festive connection... hit the chart in the middle of January. And, if you missed it (and are interested), my top 100 songs from 2013 starts here. 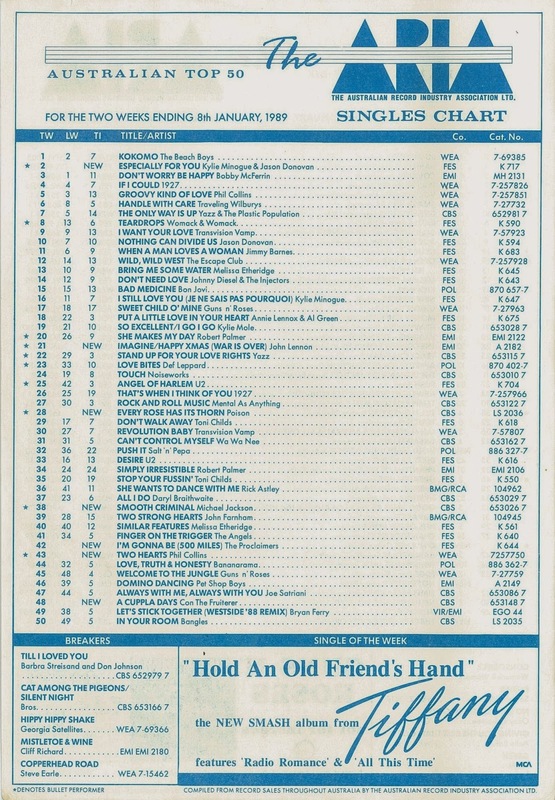 This was the first ARIA top 50 chart that Take 40 Australia used for their countdown (at least since I started listening to Take 40 circa late April 1988), airing the following weekend. Soon afterwards, I realised that the Rage top 50 was one week ahead of Take 40 (and included an extra 10 songs at the bottom end of the chart), so switched to using Rage to note down the charts. And so my music video collection evolved... coupled with setting my alarm clock for 5:30am on Saturday to get up to watch the top 50. Eventually I didn't even need to set the alarm, I could just wake up at that time on a Saturday [img]http://www.madfruit.co.uk/forums/public/style_emoticons/default/paranoid.gif[/img] Something I could never do now. I remember hearing/seeing 'Radio Romance' for the first time on Xmas day '88, at a cousin's house, on one of those airing-for-summer-only music video shows, 'Top 40 Video' (playing as a hit prediction or something). I found it unusual that a brand new Tiffany song had such little fanfare (this was the only time I caught the video). I also remember thinking that the song didn't seem very good, even vocally (sounds like she has a bad cold IMO, not to mention the cheap production). 'All This Time' was released here as the 2nd single from the album. With regards to the actual sales date covered by this chart (and other ARIA charts of the time), I assumed (perhaps incorrectly) that the chart at this time was published on the Monday of the week covered by the 'week ending' date (i.e. Jan 2, 1989 for this chart), covering the sales period of the week before this - or 2 weeks in this instance (i.e. Dec 19, 1988 to Jan 1, 1989 inclusive). At least around 1994-5, when I was aware of some singles' actual release dates, they debuted on the ARIA chart the following week (ending). Although I do remember seeing in subsequent years that ARIA wouldn't add the extra weeks (over the Xmas break) to the 'TI' (time/s in?) column until the second published chart of the year... but I see they've added 2 weeks to the TI tally for the singles on this chart. It's all very confusing. Yeah, I'd been recording the Rage top 50 from some time in 1988, I think, since my days of getting up early on a Saturday morning were behind me. It made everything so much easier than having to sit by the radio for hours on a Sunday (although I would later do that again once American Top 40 and UK Chart Attack started). The whole issue of when charts were published and what sales dates they cover is a bit confusing, but I did check with an authority on the matter about this chart specifically. However, I should really call ARIA's chart dept and look further into it. And yeah, I figured Australia went with the upbeat Tiffany track rather than the ballad first - as they did in the UK. It would have very strange, if All This Time had come out first, for a brand new Tiffany track to completely miss the top 100. The speed of her descent was alarming, but the songs just weren't up to much. I used to get up at 5.30 on Saturday morning and watch the rage Top 50 too - every weekend in 1988 and into '89. I would set up a bed next to the stereo and tune in rage on the ABC signal on FM radio. Have my blank audio tape ready to hit record for all the songs I needed, esp. the new tracks. Did the same for The Factory, but by that time, the bed was put away and was eating breakfast. I first saw the video for 'Radio Romance' and the last time on The Factory. I still have it on the audio tape I recorded it on. I also loved recording all the new tracks off The Factory. Thought I was pretty cool having all the new releases from the weekend and felt way ahead in what's new in music from the general public. LoL.